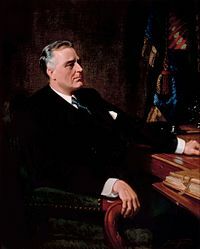 English: Franklin D. Roosevelt (1882–1945) was president of the United States (1933–1945). Norsk bokmål: Franklin D. Roosevelt (1882–1945) var president i USA (1933–1945). Slovenščina: Franklin D. Roosevelt (1882–1945) je bil triintrideseti predsednik Združenih držav (1933–1945). 1941, Dec. 8, Franklin D. Roosevelt speech after the attack on Pearl Harbor. Alternative part 1 – "Date which will live in infamy" (significantly denoised). Franklin D. Roosevelt and french General Henri Giraud, January 19, 1943. Franklin D. Roosevelt and Edwin Barclay, January 27, 1943. Meeting Anthony Eden at the Quebec Conference, 1943. Funeral procession, April 14, 1945. Photo taken by en:User:Malcanthet at FDR's home/museum in Hyde Park. Plaque of Franklin D. Roosevelt for the dime. The sign outside the Franklin Delano Roosevelt Memorial.